So things in hell are going well, thanks for asking. Selling your house For Sale By Owner during the holidays is super fun and festive. I especially like it when the tree topper falls off and more lights go out every five g.d. seconds. Ah, Scrooge it. It’s only two days ’til Christmas. 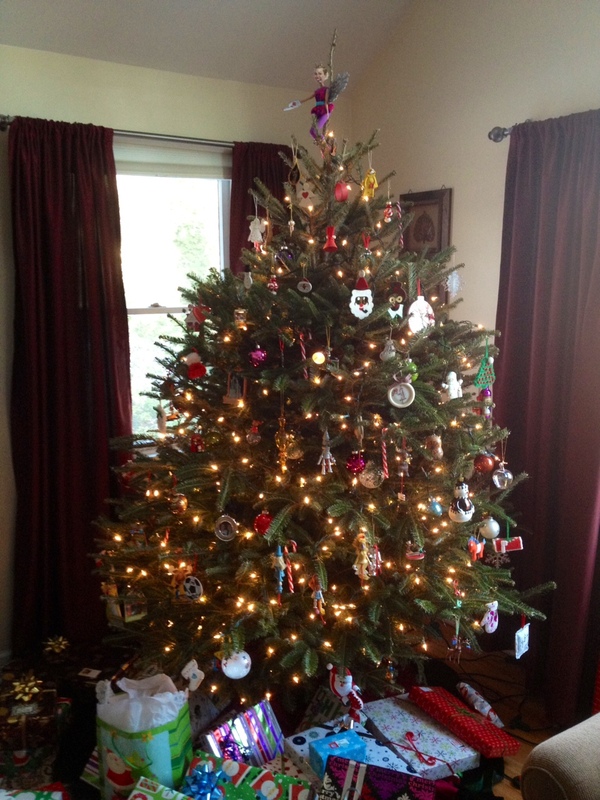 Speaking of tree toppers… Every year, my mom, Babs, decorates a beautiful, live tree and places her beloved star on top. Not a star star, of course. Don’t be ridiculous. My blog mascot, a chipmunk (featuring my former blog name). “I just don’t know,” she sighed. “Miley,” my dad replied, turning back to his New York Times and coffee. Yes. The man who seemingly only put up with this tradition out of a desire to pick his battles, proved himself the fourth wise man of Christmas 2013. Well done, Mom & Pop. Well done. Next postGuess Who’s Not Obese?! Love the tree toppers! I used to have a Snoopy toy dressed up in a Santa Claus outfit that i had made for it as my tree topper, but no more, just a regular old fairy that looks like a cabbage patch kid on the top of ours now. Merry Christmas to you! Why, that sounds like an extraordinary fairy to me! Man. I think I asked for a new Cabbage Patch doll every year for about 8 years. Merry Christmas, Vanessa-Jane! I hope you have a splendiferous holiday! 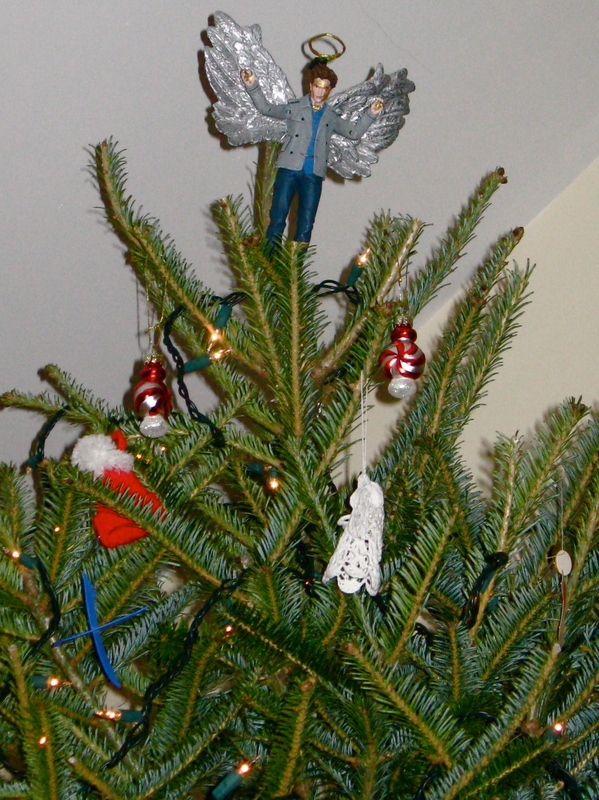 We’ve had Elvis on the top of the tree for many years now. Thank God it’s not the fat Elvis – that would have broken the branch. Heh heh I should try leaving Santa a banana-peanut-butter-bacon sandwich this year! Maybe then he’ll give me some house buyers for Christmas like I asked. “Miley,” my dad replied. bwa hahaaaa! Thanks for my morning guffaw. Question: how do you go to sleep at night knowing that she’s on top of your tree? Also: Edward Cullen made an appearance in my post this morning as well. JINX! JINX (for the ten billionth time…get out of my head!)! I’m staying over [my parents’] tomorrow night, and insisted on taking the bedroom farthest from the tree. Tree toppers and real estate agents, two thing that go away shortly after you use them… Merry Christmas!!!! Ha! Boy will I be glad when this is a distant memory (the house selling, not Miley… I want to hold onto that memory for all the rest of my days)! When they sell this house I will be dead. Then they will know what suffering is.. In your state do they have disclosures such as , ‘Has anyone resided in the house who had died of AIDS or has had chemo?” Oh California! Babs does not realize she’s sitting on a gold mine here. I’ll bet even the new Pope would get a kick out of this. He seems like a guy with a sense of humor, unlike the living corpses he replaced. I’ll let someone else comment about the stick Miley is perched on. You pitched that one right over the plate. I’m biting my knuckles to keep from stealing any punchlines. You have the restraint of a saint [Nick]! Happy holidays, my friend! It’s like Christmas and Halloween combined. YES. I’m urging Babs to use that in her marketing campaign when she takes this thing to the next level. Best. 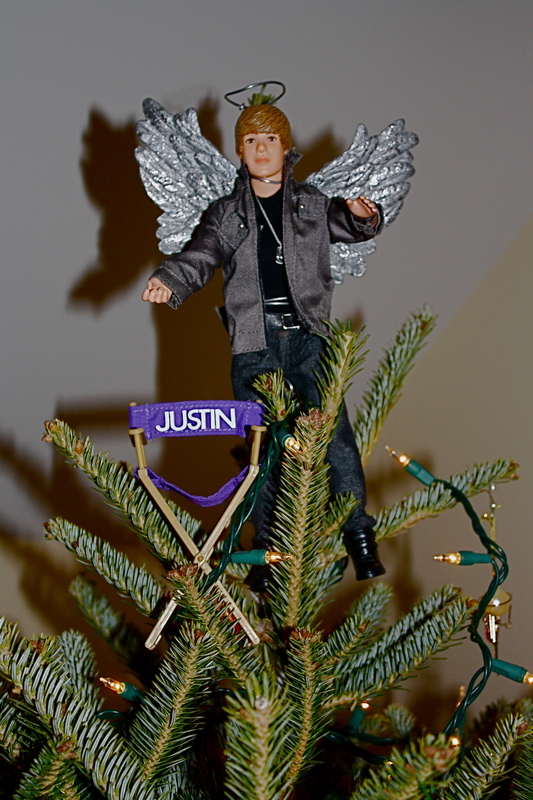 Treetopper. Ever. Go Babs Go. I’ve never been more proud of my parents. Except when they had me. Oh my god, Babs is awesome! I love the “Star” treetopper idea! So wrong it’s…still so very, very wrong. Babs and Dad are da bomb. Happy New Year, Peggles (deja vu)! Babs and Mr. Babs were most definitely the driving force behind my original blog name. The Miley does not fall far from the Christmas tree. Be careful. There’s a good chance she’ll start licking the ornaments. Don’t worry. Babs hung the 2001 ‘NSync ones on the bottom. This might be the single-most-awesome Christmas tradition I have seen thus far in my life. Your parents rock. Thank you! I can’t argue with that. Especially when remembering what they put under the tree (and by that I mean VODKA). Babs is so awesome. Does she know how to twerk? I see another “How To” video in your future. Your tree stars are awesome. Merry Christmas Jules! Thank you so much, Sandy! Happy New Year!! I was thinking of you this morning. Hope all is well and that you had a wonderful Christmas (in spite of). That is fabulous. Babs never stops amazing me. I’m a little curious as to where the wrecking ball is, however. But still, stellar job! I’ve been wondering how things were going for you! Hell? Ay! I’m wishing you a wonderful 2014 filled with health and happiness and a house sold! Feliz Navidad, Jules! Thank you so much, Maria, and Happy New Year! This ‘house showing’ business is FOR THE BIRDS! Was your dad actually being helpful or was he in the middle of a lazy boy induced nap and just randomly shouted out Miley at just the right moment because his dream coincided with your mom’s pondering? You know what? This comment was funny and made sense in my head, but is clearly going nowhere so “eff” it. You’re welcome there, o queen of the chipmunks. Have a great Christmas, Jules! I hope that g d house sells one of these days! Thanks, Don! ME TOO. I’m so in love with your Christmas family shot, by the way. Though it could have been improved with a ‘doodle. Ha! Amen! Just for that great joke I’m regifting you this Starbucks mug gift set. Thank you so much, Dana! Happy New Year to you! 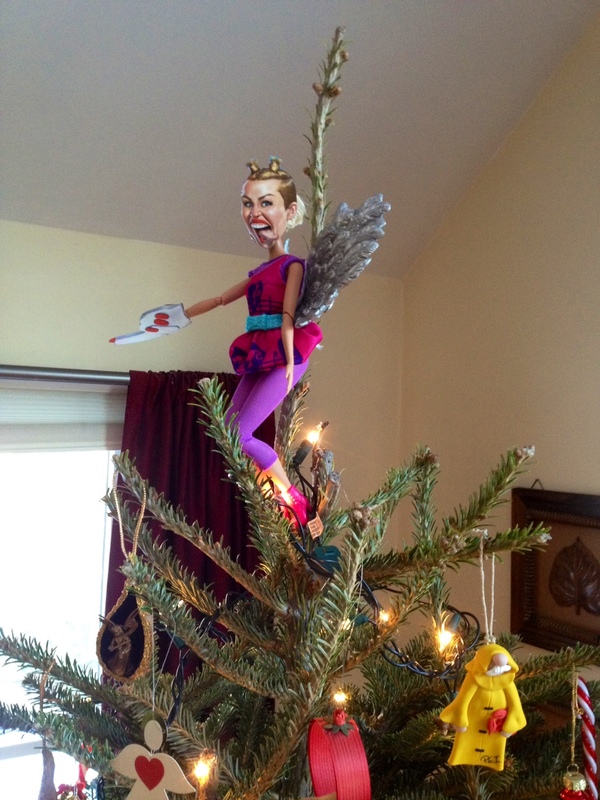 If I ever have kids, I think I’ll use the Miley angel instead of Elf on a Shelf to keep them in line. Thanks, Hook! Happy New Year! Right?!?! (See what I did there?) I cannot wait to sell this house so I can get my life back and get caught up with my favorite bloggers (psst – that means you)! Lolly! Hi! Thank you! I’m usually better at replying to comments (or at least better than I am at replacing lights on Christmas trees) – sorry this was so late! I hope there are many more smiles to come in 2014. Perhaps at Miley’s expense. O….M……G…… WHERE did you get Miley?????? Oh, you don’t even KNOW how Babs (my mom) rolls. She MADE that shiz! Babs, meet Jennie. Jennie, Babs. I think this is the beginning of a beautiful friendship. Hello Babs. Lol. I would seriously run out and buy that and use it wherever I possibly could. I was just telling someone it should be the new ‘Elf on a Shelf.’ If Miley Angel couldn’t keep a kid in line during the days leading up to present-a-palooza, I don’t know who could! A single tear of happy joy is welling in my left eye waiting to trickle down my cheek slowly as I type this. I hope you had a merry Christmas. Oh, that’s perfect, because I got you Kleenex for Christmas! I’m afraid it’s a regift, though. That is quite the tree topper! whoa…. I hope you had a Merry Christmas! I didn’t get near a computer for days! Sus! I hear that! 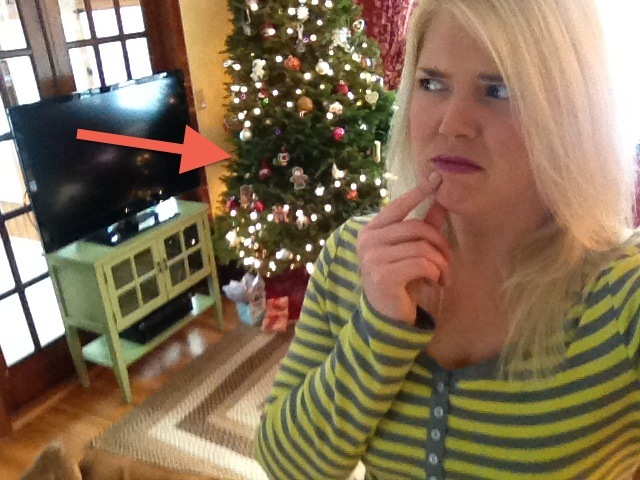 My whole life lately has been showing this house; I’m so out of the bloggy loop. I hope you had a WONDERFUL holiday, and Happy New Year! I hope your holidays were full of good cheer! Happy New Year to you! May it bring you all kids of prosperity, peace and love and bacon. This is fabulous and disturbing. I love it! Do you think fabulousanddisturbing.com is taken? Because I’ve been trying to convince Babs to start her own blog for AGES. Totally worth looking into immediately! Okay. Both fabulousanddisturbing.com and disturbinganfabulous.com are open. Jules, In LOVE with both of your parents. And, YOU! I was cracking up at the tree toppers and then I saw the Miley one (cannot stand that girl) and fell on the floor. Hence, the profuse LOVING of your Babs and Pop. You people rock it. HARD! Aw MAN! This comment is like a Christmas present wrapped in bacon. Thank you, Lizzy, and Happy New Year! hhahahaa! mmmmm…bacon….Happy New Year to you, too, Jules. You’ve made the start of my new year awesome already. Please give BigLizzy hugs to Babs and Mr. Babs. Coolest parents ever! Miles tree topper is awesome! Well done you for running a marathon! I think the build up, mental and physical training must be exhausting but completely rewarding. Spinning is the most exhilarating I’ve got with sports but NOTHING beats the outside! I write a views, news, tips site for twenty something’s. Are you going to do marathon number 2?